NFPA (National Fire Protection Association) — An organization that promotes the science and improves methods of fire protection. NFPA codes, standards, and recommended practices are intended to prescribe reasonable measures for minimizing losses of life and property by fire. NFPA sponsors the National Electrical Code under auspices of the American National Standards Institute. NFPA (National Fluid Power Association) — A nonprofit national trade association that coordinates and develops voluntary standards for manufacturers of hydraulic and pneumatic systems and components. NORMALLY CLOSED SWITCHING ELEMENT — Is one in which the terminals are wired so that current can flow through the switching element until the plunger pin is actuated to open the circuit. OPERATING TEMPERATURE — The temperature rating of the device considering both media and ambient temperature extremes. Factors that affect this rating include distance between media and wetted parts as well as installation methods. POLYIMIDE — A polymeric film possessing a unique combination of physical and mechanical properties which include long life, excellent deformation/set resistance, high resistance to temperature extremes, good tensile strength, and outstanding resistance to organic compounds. Polyimide is not recommended for water service above 140 °F (60 °C). PRESET — A factory set pressure switch available from stock, set to a predetermined set point. PRESSURE, ABSOLUTE — The difference between zero pressure (a perfect vacuum) and some known pressure. It may be arrived at by adding barometric pressure to gage pressure. PRESSURE, AMBIENT — The pressure (usually, but not necessarily atmospheric) surrounding a pressure sensor. PRESSURE, ATMOSPHERIC — The actual weight per unit area of the earth’s atmosphere at a given locale and altitude. Atmospheric pressure at sea level is approximately 14.7 psi or 30 inches of mercury or 408 inches of water. PRESSURE, DIFFERENTIAL — The difference between a reference pressure and a variable pressure. PRESSURE, GAGE — Gage pressure uses atmospheric pressure as a reference, and therefore will vary according to the barometric reading. PRESSURE, PROOF — Proof pressure (normally 1.5 times system pressure) is the maximum pressure which may be applied to any pressure sensor without causing permanent damage. PRESSURE, SYSTEM — The nominal pressure level that a system will operate at including work load. PRESSURE SENSING ELEMENT — TThe portion of the pressure switch that is in contact with and moves as a result of a change in pressure / force. The most common type of sensing elements are diaphragms, accordion bourdon tubes and pistons. PRESSURE SWITCH — A pressure switch is an electrical mechanical device that converts pressure into motion to operate an electrical switching element. PROOF TEMPERATURE — The maximum temperature of the media which the sensing portion of the switch can be subjected to without causing permanent damage. RESPONSE TIME OR TIME CONSTANT — The amount of time (in seconds) in which the sensor operates after being subjected to a step temperature increase where the difference between the initial soak temperature and actua- tion temperature equals 63% of the step temperature. The response time is expressed for a designated flow (feet per second), media and system pressure (PSIG). RISE RATE OR RAMP RATE — The number of degrees (Fahrenheit or Celsius) that the media will increase in a unit of time (minute or second). SEISMIC SHOCK AND VIBRATION — Low frequency, high amplitude waves produced as a result of earth movement. 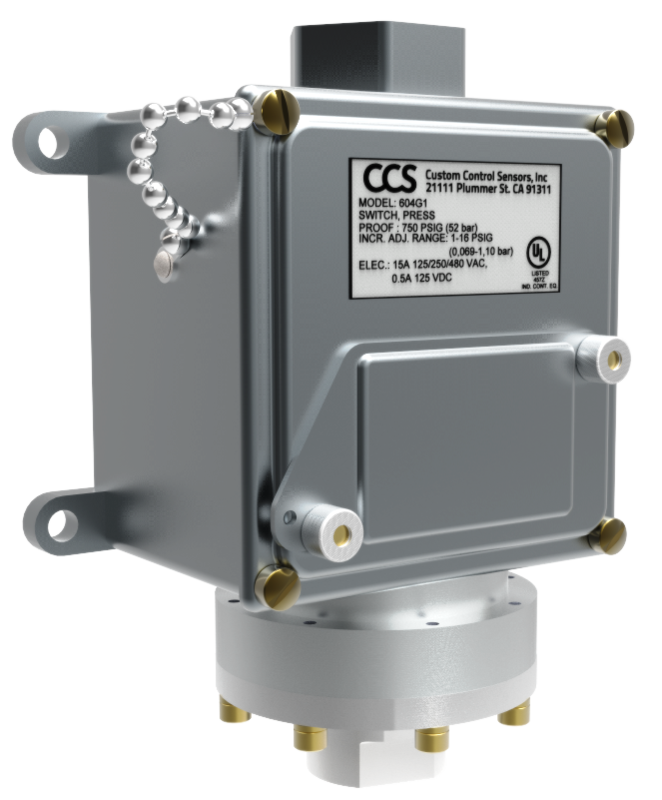 CCS pressure sensors are generally unaffected by seismic shock and vibration. SINGLE POLE DOUBLE THROW (SPDT) SWITCHING ELEMENT — A SPDT switching element has one normally open, one normally closed and one common terminal. Three terminals mean that the switch can be wired with the circuit either normally open (N/O) or normally closed (N/C). TEMPERATURE LAG — The number of degrees above the actuation point that the media will be when the sensor operates. The lag is expressed for a designated rise rate (degrees per second), flow (feet per second), and system pressure (PSIG). The lag is determined by multiplying the rise rate by the response time. Example: If a system with a constant flow, pressure, and rise rate of 10 °F per second incorporated a sensor with a response time of 3 seconds, the lag would be 30 degrees. TEMPERATURE SWITCH — A temperature switch is a sensor that upon the increase or decrease of a temperature, opens or closes one or more electrical switching elements at a predetermined set point. THERMOWELL — A housing that can be provided with temperature switches to isolate the temperature probe from the media. UL (Underwriters Laboratories) — A nonprofit corporation engaged in developing standards and testing for safety. Products bearing UL labels have been tested for conformity to UL standards. UL maintains a product surveillance program to ensure continuing conformity to UL standards. UL LISTED PRODUCT — A product that has been tested and complies to UL requirements for reasonably foreseeable hazards associated with the product and is subject to continuing UL product surveillance. UL authorizes the manufac- turer to use the UL Listing mark. UL requirements for components used in an end product which complies with UL requirements. The component is subject to continuing UL surveillance. UL authorizes the manufacturer to use the UL Recognized mark. WETTED PARTS — Materials in a sensor that are directly exposed to the media.